Recruiters are feeling more pressure than ever to find, evaluate, and hire great candidates. That makes talent acquisition a round-the-clock job, but since you can’t be in front of your computer 24 hours a day, we created BambooHR Hiring to put the speed, power, and ease of the BambooHR ATS in your pocket. Simply put, BambooHR Hiring helps you hire the right people before someone else does. Take your HR system to go. Access time-off requests, a company directory, and more from anywhere you go with the BambooHR mobile app. When the average qualified candidate is off the market in just 10 days (it’s true! ), the speed at which you move candidates through your review process is critical. It also says a lot about how your organization works as a whole. With BambooHR Hiring, you’re able to review resumes, cover letters, and answers to application questions the instant candidates apply. Applicants say communication is the number one deciding factor when judging their candidate experience. And that experience affects far more than just the decision to join your organization—it impacts loyalty, engagement, performance, and even their length of employment. 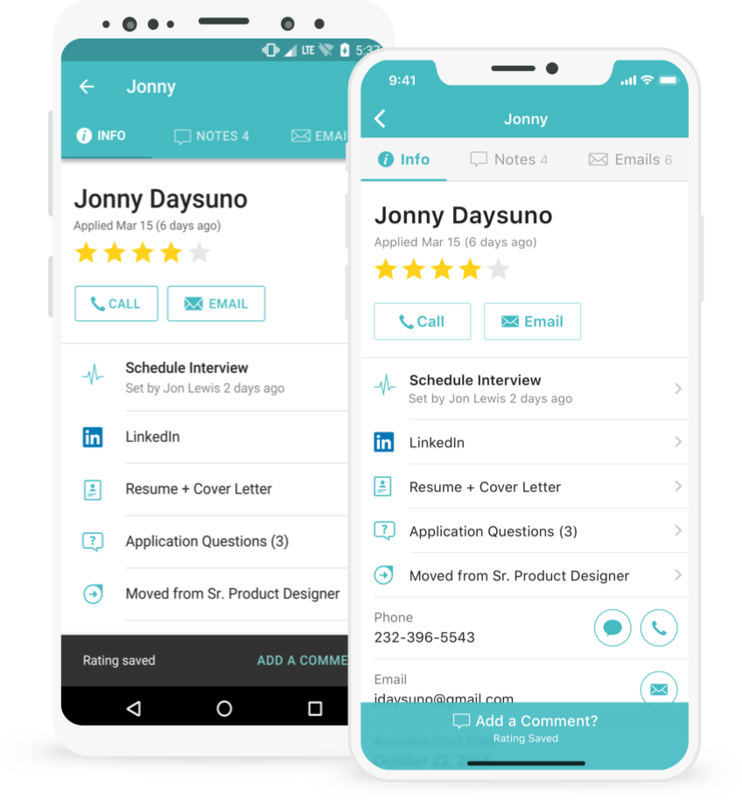 BambooHR Hiring has everything you need to keep communication consistent and timely, including contact info and auto-populating email templates to keep candidates in the know. Internal hang-ups and delays are one of the most frustrating aspects of hiring—especially for recruiters who know top candidates won’t wait around for a late reply. With BambooHR Hiring, you can coordinate with hiring team members from anywhere, which makes it a snap to sort through applicants and keep the best ones breezing through each phase of your hiring process.